Bronze makes a noteworthy entrance into the Oris collection with this commemorative model paying tribute to Carl Brashear, the U.S. Navy’s first African American master diver. Previously little used in watchmaking, this metal is notably distinguished by its oxidation giving it a unique patina. 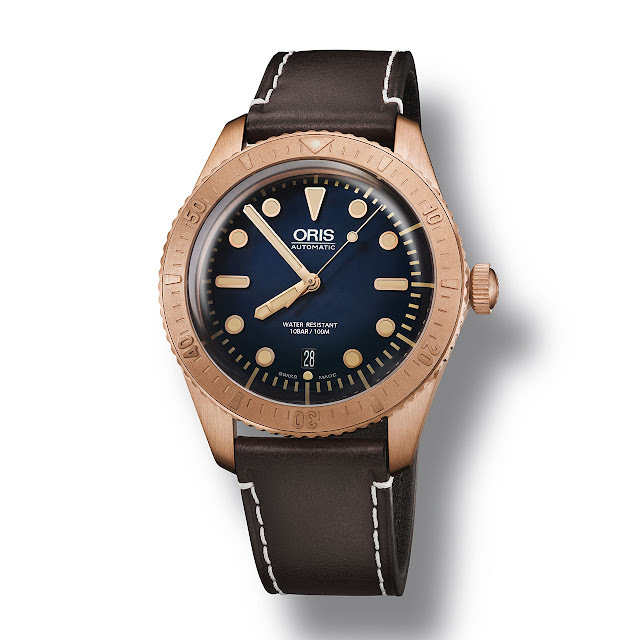 Initially bright and shiny, the case and the unidirectional rotating bezel gradually darken over time, according to its owner’s habits, thereby making each timepiece in the Oris Carl Brashear Limited Edition truly unique. 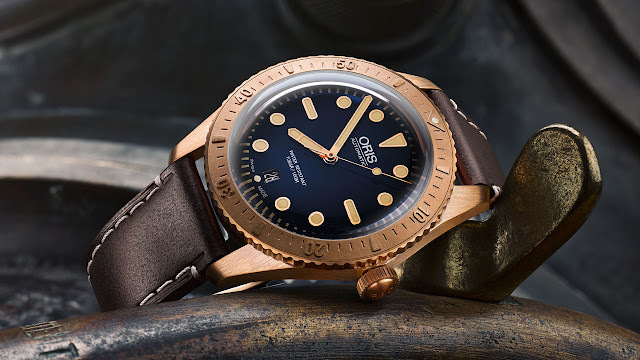 Clearly referencing the history of deep-sea diving, this eminently legible and functional model – a nod to the deep-sea diving helmets from the 1950s – is ideal for underwater exploration, since the 2,000-piece limited edition is water-resistant to a depth of 100 metres. Mechanical automatic, Oris Calibre 733, Sellita SW200 base. Bronze case middle and bezel, 42 mm. Unidirectional rotating bezel with 60-minute timer scale. Bubble-curved sapphire crystal with anti-reflective coating on both sides. Stainless steel caseback with special engraving. Water-resistant to 100m (10 bar/300 ft). Dark blue. Superluminova-coated pink gold-plated hands and hour-markers. Date at 6 o’clock. Dark brown leather with bronze pin buckle.